Here is a post long overdue rounding up some recent ambient and electro-acoustic releases. Despite the fact that some of them come from the same label, they nonetheless represent an amazingly diverse pool of sounds, ranging from guitar driven Americana, neo-Classical and even pure electronica at the fringes of techno which is one way of highlighting the fertility of ambient music. Apologies and thanks to the many people who sent me stuff for review, particularly Experimedia and also Lawrence English at Room 40 and sorry I couldnt put it all in. Barcelona-based Santiago Latorre’s album “Eclíptica” has been quite hard to get in physical format despite being one of the national albums of the year in 2011. Originally coming out on local label Foehn Records, it has now also seen the light of day in the US via Accretions, but still proves a little hard to get hold of outside of iTunes. The success of “Eclíptica” also means that Latorre has had some high profile shows, playing at this year’s Micro Mutek festival and later in June he will play at Primavera Sound and Sonar. Latorre’s take on ambient music is not so immersive as elaborate, fitting in nicely with labels like Type who mix ambient electronics with home listening classical tools. The results then are not surprisingly unlike film soundtrack material or even the more abstract fringes of indie rock where groups like Sigur Ros, for example, employ similar methods to great emotional effect. One of the strengths of “Eclíptica” is also its diversity, both in palette and choice of instrumentation, but also in composition. Latorre uses both short songs like emotional glyphs or longer, winding compositions to create the feeling of narrative. The whole is a concise and detailed journey through a beautiful sound world. There is a great deal of sadness behind the beauty of Celer’s latest releases including “Evaporate and Wonder” on Experimedia and the handful of other albums and 7”s to sneak out this year, including several with Machinefabriek. The source material was recorded in May 2009 only two months before the untimely death Danielle Marie Baquet who was the wife of William Thomas Long and one half of Celer with him. Long has since then slowly worked through the wealth of material recorded before her death and will apparently close the prolific and tragic Celer saga when finished processing the material. The cover image of two still boats on a quiet shore somehow seems more poignant given the story. Musically the texture and mood will be familiar to fans of the duo, consisting of two side-long tracks of delicate synthesizer drones gentle enough to sleep too, but with still a lot of detail in the production and a plenty of emotive swells that stand up to closer scrutiny. In particular, the use of field recordings way, way down in the mix gives the shimmering surface a more tangible edge, like slowly waking from a deep sleep while having the room enter your dreams. The two sides do not differ greatly from each other, but are nonetheless a beautiful and elegant pair of tracks that bring with them a lot of peace and serenity. Fans of Bvdub can be excused for feeling a bit overwhelmed with his recent output. According to Discogs Brock Van Wey has released nine solo albums since 2011 and one more with Ian Hawgood, not to mention his now annual track on Kompakt’s Pop Ambient series and even a 12” under the East of Oceans moniker. Such prolificacy has attracted plenty of doubters, but the truth is that it doesn’t take much of a scratch to see that below the surface Bvdub has changed quite a bit from the early days. “Serenity” and its companion album “Don’t say you know”, which were generously bundled together by label Darla for the first 500 copies, are a case in point. “Serenity” breaks with the poetic song and album names of the past, while both discs are remarkably more upbeat than some of the earlier albums. One way Bvdub achieves the lightness is by the addition of beats in nearly every track, giving a more up-tempo feel. The beats are not as heavy as his first techno outings, and are mostly slow techno rhythms, like on “Beauty”, but there is even one foray into the world of rollicking break beats on “My sun shines through your rain” off “Don’t say you know”, as classic rave as Zomby’s “Where were you in 92?” album. The length of tracks is also more variable from the relatively shorter 7 minute songs to longer opuses that push the 30 minute mark. There are also a lot more discernible vocals higher up in the mix diminishing the sense of isolation and loneliness that are so critical to Bvdub’s intimate sound. That is not to say that it is all feel good schmaltz, rather the opposite: the foundation of Bvdub’s sound is still a complicated well of slowly changing emotions, but now one in which there is someone else in there along with you. This collaboration between Sam Wood (aka Sam KDC) and James Clements (aka the prolific ASC) on Clements’ own Auxiliary label is slowly becoming one of my favourite ambient releases of the year. In many ways it is quite classical and conventionally arranged, yet it nonetheless retains the power to engross by adhering to some sense of vague narrative and by deluding and lulling the sense through this unfolding story. Opener “Lost negatives” sets the scene with its dark atmospheres and suspense, the title perhaps suggesting a take off point for some imagined story. As the track draws to a close, lost voices and fearful calls raise the spectre of some lurking menace which then carries through the album. The central track “Block 4” is the highlight. Burial-esque urban moods cross paths with a gentle downpour of metallic drones and prickly glitch all hovering over a whirlpool of bleak voices and dystopian sounds. The remaining tracks also have a lot of character embedded in their metallic surfaces. Timbral changes are wrought frequently, but steadily with magnificent skill so that each track seems to pass through several layers of sensation. It is a rather down beat tale they tell, but an absorbing and immersive one nonetheless. “Woven tide” is the debut album by From the Mouth of the Sun, a duo consisting of Swedish musician Daq Rosenqvist and Experimedia stalwart Aaron Martin, known for his remix work for the collective Lüüp, who covered one of his tracks “Spiralling”, and for his solo album “Worried about the fire” which was one of the label’s highlights back in 2010. Extracts from “Woven tides” and some of Martin’s solo work will accompany a documentary and a short film by Ross McDonnell and Carter Gunn entitled “Remember me, my ghost” about the ill-fated Ballymun Towers housing project in Dublin. The music is a pastiche of acoustic instruments, with different strings and guitars blending with piano, xylophones and chimes and at times processed through reverb and allowed to feedback to accumulate into crescendos of noise. Given the context of the film for which the material was intended, it is not surprising to find a certain emotional darkness and a sense of tragedy and ruin in the music and their accompanying titles, such as “Sitting in a roofless room” and “Pools of rust”. Collectively the album paints a picture of bare emotional survival, rather than hope. A good point of reference might be Deaf Centre, but there are a lot more folk elements to “Woven tide” that keep it somewhat grounded and away from the all-consuming abyss of “Pale ravine”, for example. A touching and beautifully realised album. Maybe it is just what has come my way, but there seems to have been a fair bit of acoustic-guitar driven “ambient” music these days. One other example that immediately comes to mind is Mike Cooper’s “Distant songs of madmen” which was recorded live in Palermo, Italy in June 2011 and released as a free download by Australia’s Room 40 imprint. The press release from Rubber City Noise for this split release between Andrew Weathers, originally of Chapel Hill, but now resident and studying in Oakland, and relative new comer Ancient Ocean from Brooklyn on the flipside describes it aptly as “ambient Americana”. Weathers’ work in particular is like a 21st Century version of “Paris, Texas”, where drones vie for attention from improvised finger picked folk-blues guitar. Ancient Ocean uses the guitar much less than Weathers where it appears more as an accompaniment to the drones, rather than the other way around, but he also has space to vary his style a bit more away from the limelight. Weathers music works by creating a sense of time across the duration of each track and the side as a whole, bringing the mood in and out of focus, whereas Ancient Ocean’s three shorter pieces are more like classic ambient vignettes. Each one works independently with an emphasis more on texture than outright mood. The addition of guitar gives each track a shoegazer feel, especially on “Seneca”, even where the guitar verges on flamenco style in “Castelwood”. Despite coming from two distinct artists, apparently on opposite sides of the US there is a strange fraternity between the two sides, both of which somehow purvey a greater sense of peace and exposed tranquillity. It riles me a bit that Bristol's Emptyset get labelled as techno when there is scarcely a beat on any of the material of theirs that I have heard. Sure, they produced a nice piece that eventually wound its way into the hands of Chris Liebing and others, featuring none other than Cornelius Harris from Underground Resistance reciting a poem by Aleister Crowley. But Emptyset have more in common with musique concrete than techno, working laboriously with samples to produce sounds that are deceptively simple and then arrange them in an uncharacteristic framework that has more in common with industrial music. “Medium” sees the American-English duo of James Ginzburg and Paul Purgas taking their obsession with method to new extremes. 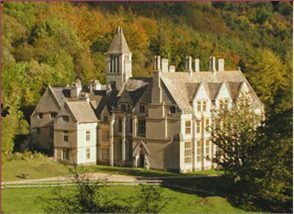 The primary material for the short album was recorded in Woodchester Mansion, a 19th Century gothic mansion in Gloucestershire that was abandoned during construction upon the death of the owner. The duos quest to generate new forms from sine waves, white noise and field recordings generated becomes extended to be a search for new spaces for these sounds to exist and interact outside the machine they are created in, as if the sounds were encouraged to haunt the house and the house invited to haunt the music in a feedback loop. The results are typically dry as most Emptyset releases, not to mean unapproachable or academic, but their music rarely give you much feeling or any sense of motion. It is music that seems to press directly for the unconsciousness, or the part of awareness that is never inscribed in memory. The enjoyment is in the atmosphere and the detail and is best listened to in the dark and even with head phones. This release in particular seems to implore you to head straight for the background to listen for voices and hear hidden currents of air and banshee yells in the distance. One added importance of this album is how it and the Crowley-influenced single neatly complement the trend over the last two years for occult-based electronic artists, from Demdike Stare, through Witch House, the Tri Angle label and so on. There is a thesis in there somewhere. One of the most enduring features of Ben Frost’s outstanding “By the throat” is its ability to convey a sense of story through abstraction and association, almost never resorting to simplicity, condescending sounds or obvious transformations. These skills make Frost the ideal choice to recreate the celebrated story of “Solaris” which is full of nuanced states of isolation and anguish and the need to convey an overwhelming sense of time and an ambiguous idea of life itself. The original story is based on the novel by Polish writer Stanislav Lem and immortalized on the big screen by Russian director Andrei Tarovsky who has proved a deep mine of musical inspiration over the years. For the soundtrack, which was commissioned for the 2011 Polish Unsound festival, Frost is joined by fabled Icelandic composer Daniel Bjarnason who has worked with Sigur Ros and Múm amongst others. The duos method was to improvise an initial score while watching the film and then recreate it in detail using samples of classical instruments plus, presumably, their own playing. In keeping with the story, the results are quite sparse at times, with a lot of detail occurring at the edge of perception or in the loneliness of silence. But while intricate and well-structured as an album, “Sólaris” does sometimes feel like there is something missing, which may be the dialogue or perhaps the onscreen scenery and immensity. In addition the detail is sometimes so microscopic that one wonders how it would work in the cinema and if it would be possible to listen so closely while also visually engaged? One final gripe might be the timing of the album which surely does not match the film, begging the question of what else is missing from the duos original commission? “Sólaris” is a fine example of neo classical and a rich work for home listening, but whether its significance is enhanced or diminished away from the film is perhaps a question of taste and interpretation. When Stroboscopic Artefacts first announced a limited edition 10” series of experimental and ambient music to be housed in a unique metal tin box I couldn’t have been more delighted. Such augmentation of direction of labels is generally a good thing, especially one the calibre of SA which has already shown willingness to drift away from the campfire light. Couple this with the chance to own an objet d’art and I was easily sold. However, the final satisfaction of the whole “Stellate 1” has been slightly tempered, not by issues of quality per sé, but by quantity, which is a somewhat superficial reason in the end. But if I am already going to make myself feel guilty for spending a lot of money I don’t have and increasing my carbon footprint substantially to own this music, then perhaps there should be a little bit more music to make me feel a little more equilibrated. But in the end of the four artists, Lucy puts in a whole six minutes over two tracks, Borful Tang and Perc seven each, while Kevin Gorman’s 12 minutes feel almost epic. In all cases the music is great, but just not enough of it. Lucy’s short tonal works sound brilliantly realized and more so for the contrast with his steely techno. Borful Tang is the most subtle of the four, mixing radio voices with hazy classical veils and reverb, whereas Perc’s opening track “Paris” sounds remarkably like parts of Popol Vuh’s track “In den garten pharaos”. Kevin Gorman’s “Frequency phase” studies use processed sample loops that are set out of phase to create uneasy rhythms and timbral collisions. Gorman’s pieces also lead up nicely to the recent announcement of the second edition which will focus on loop based works. If I told you that Andrea Belfi’s new album was based around drum improvisation on a modified rotating system to create feedback you might be expecting some kind of abstract noise piece or 40 minutes of absolute racket. But the truth is “Wege”, meaning path or way in German, is a highly restrained effort, where placement and accuracy are more important than power. The result is almost a pointillist ambient, where sounds are pushed outwards into space, which is then allowed to fold back inward and isolate the original sound. The bigger picture only emerges from a great distance, when all the tiny sonic zones blur together. But “Wege’s” four tracks are not just the Italian electro-acoustic musician and his Steve Reich-inspired machine alone. Belfi is joined by a host of collaborators who form the canvas as it were over which Belfi paints his sound. The numerous collaborators contribute voice, guitars, strings and electronics among other less recognizable sounds which stay carefully in the distance and by doing so add a persistent tension to the space and the unpredictable rhythms. The result is far more eclectic and engaging than words can convey especially for an album that almost intentionally shuns expression of recognizable emotion. In its place is a sense of ritual and of natural neutrality, a kind of harmony of being with a non-existent place, neither of which is ever fully described and are only suggested: echoing drone passages consume the silence and disappear suddenly, instruments scrap and scrape to efface themselves, or bells and gongs convey a sense of religious awe.